We closed October strong. Let's see if we can keep it rolling in November. As always, home teams in BOLD. How the (relatively) mighty have fallen. Two years ago, Western Kentucky was capping off a second consecutive Conference USA title with a bowl romp over Memphis. Now, the Hilltoppers have lost five consecutive conference games dating back to last season and will likely need an upset along the way to avoid a two-win campaign. It may be a bit of an oversimplification, but when Jeff Brohm left, the program cratered. Maybe the administration will give Mike Sanford Jr. time to pull the nose of the plane up, but his tenure thus far has been a disaster. So of course, I recommend you take them this week. Why? Well, for starters, Middle Tennessee is coming off a rather misleading victory against Old Dominion. The Blue Raiders scored 51 points in an easy road win against the Monarchs, but they allowed almost seven and a half yards per play. Timely turnovers, including a 100-yard interception return for a touchdown contributed to the bloated margin. And gamblers are paying a tax on that margin this week in the form of this enlarged number. Western Kentucky is not good, but until last week's outburst, Middle Tennessee had not scored more than 34 points against an FBS opponent. Without another glut of turnovers, that is probably their ceiling here too, and I think a more reasonable expectation would be about ten points less than that. Plus, for all their struggles this season, Western Kentucky has actually played well in the role of road underdog, covering all three times they have been in such a position, with one outright upset and another near miss. Take the Hilltoppers to cover here. Since giving Oklahoma all they could handle in Norman, the Army Blacks Knights have reeled off four consecutive wins and are bowl-eligible for the third straight season. With two FCS opponents and a down Navy team remaining on the schedule, Army has a decent shot at finishing the regular season with ten wins. Based on the 'others receiving votes' category, Army is 40th in the latest AP Poll. If they can win those final four games and then squeeze out a bowl win, they could find themselves ranked for the first time since 1996! But before any further discussion of ranked finishes, Army must deal with their first leg of the Commander in Chief's gauntlet. Air Force has already beaten Navy, so a win by the Falcons would lock up the prestigious award for them. However, Air Force is already saddled with five losses, so they must win three of their final four games to avoid a second consecutive season with no postseason appearance. The primary culprit for the Falcon's 3-5 start has been their pass defense. In their seven games against FBS opponents, the Falcons have allowed 9.1 yards per pass with eighteen touchdowns and just three interceptions. Basically, the Falcons are turning opposing quarterbacks into McKenzie Milton. However, that critical deficiency is not likely to matter in this game. If you haven't heard, Army runs the triple option and passes either out of necessity on third and long or to surprise opponents on early downs. The key to their offense is consistently gaining yardage on the ground on early downs. And wouldn't you know it, Air Force does a decent job against the run. The Falcons are allowing under four yards per carry this season (even when disregarding sacks from the total) and have not allowed more than 177 yards on the ground in any game this season. Oh, and Air Force also runs a variant of the option, so it should not be as exotic to them as it is to other teams. Army is just 5-8 ATS as a home favorite under Jeff Monken and the Black Knights have not scored more than 21 points in their four previous meetings with Air Force under Monken. Take the Falcons to keep this one close and don't be surprised if they pull an outright upset. Last week's victory over NC State made Syracuse bowl eligible for the first time since 2013. The win, combined with the deluge of losses of top-25 teams allowed Syracuse to move into the AP Poll for the first time since 2001! Now comes the hard part for Syracuse. No, I'm not talking about winning as a ranked team or winning on the road. I'm talking about winning in November. Under Dino Babers, the Orange are 0-8 in the month of November. After 4-4 starts in each of his first two seasons, the Orange have been outscored by nearly 27 points per game in their eight November losses. That continued a trend that began under Babers' predecessor, Scott Shafer. In Shafer's last two seasons, the Orange went 1-7 in November contests meaning they have lost fifteen of their last sixteen November games! The good news for Syracuse is that Wake Forest, in particular the Wake Forest defense, may be just what the Orange need to end their November skid. While the Demon Deacons won last week and likely consigned Louisville to a 2-10 season, they still allowed 35 points and nearly six yards per play to the Cardinals. For the season Wake Forest has allowed nearly seven and a half yards per play to ACC opponents. In addition, the Demon Deacons have allowed an amazing 25 touchdowns through four conference games! To put it kindly, the Syracuse offense is unlikely to encounter much resistance in Winston-Salem. Wake Forest will probably be able to move the ball and score some points of their own, but both of these teams play at a blistering pace meaning there should be more possessions than your average football game. More possessions limit variance and make it easier for favorites to win and cover. Last season's game featured over 100 combined points. This season's game might come close to that number, and I expect Syracuse to come out on top by at least a touchdown. Congrats to the San Jose State Spartans as they won their first game of the season last week, and just their second against an FBS opponent under coach Brent Brennan. Who was their other FBS victory against? Wyoming of course. In the numerology business, that's what we call symmetry. Or perhaps its just a coincidence. Anyway, I can't believe that Wyoming is a two-touchdown favorite over anyone. The Cowboys did win at Colorado State in convincing fashion last week, and the lazy narrative is easy to piece together. Wyoming's offense exploded for a season-high 34 points thanks to the play of new quarterback Sean Chambers. Certainly, Chambers played well, but Colorado State has one of the worst defenses in the Mountain West, if not the country. While Wyoming did manage 34 points, that number represented the fourth best defensive performance of the season for Colorado State in terms of points allowed. I think its folly to expect Wyoming to be an offensive force after just one start from Chambers. San Jose State has been a massive road underdog three times already this season and they were competitive in two of those games, including nearly winning outright against San Diego State two weeks ago. Take the Spartans to keep this one close. Let's call this a 'Freaky Friday' game. Why you ask? Because this game is all about roles, and were the roles reversed, I would be all over Marshall. Neither of these teams performs well in the role of favorite, but both have done very well in the role of an underdog. In 2013 and 2014, Marshall fielded one of the most dynamic and explosive mid-major offenses with Rakeem Cato, Devon Johnson, and Tommy Shuler helping the Herd average over 40 points per game both seasons. In those two seasons, the Herd were favored by double-digits a remarkable eighteen times. The Herd were 12-6 ATS as double-digit favorites and 15-10 ATS as favorites overall. However, since then, the Herd have been more of a defense first team. Since the start of the 2015 season, Marshall has been favored 24 times. The Herd are a much more pedestrian 11-13 ATS in those games. If we remove the successful 2015 season, they have been even worse, posting a 4-11 ATS mark since 2016. However, as an underdog, Marshall has excelled, posting an 11-5-1 ATS record with six outright wins! Contrast this to Southern Miss under Jay Hopson. Hopson took over coaching duties prior to the 2016 campaign and in his nearly three seasons in charge, the Golden Eagles are just 6-12 ATS as a favorite, but 7-5 ATS as an underdog. Southern Miss has rarely been a home underdog under Hopson, but they have covered both times. With last week's loss to Charlotte (shockingly as a favorite), the Golden Eagles need to find some wins if they hope to get back to a bowl game. This line should be more like a pick 'em, and I would not have been surprised if Southern Miss opened as a favorite. Take the Golden Eagles to get right at home with their backs against the wall. Editor's note: You are a huge degenerate and have a real problem if you bet this game. With that PSA out of the way, I think there is a great deal of value in this game with a UTEP team that has gone nearly two calendar years without a win. The Miners have been quite competitive lately, losing one score games to North Texas and Louisiana Tech. In conference play, the Miners are being outgained by about half a yard per play. Those aren't great numbers, but as a point of reference, UTEP was outgained by more than a yard and half per play in conference play last season. Meanwhile, Rice has been one of the worst teams in Conference USA. The Owls have been outgained by an astonishing three yards per play in their five conference games (last season they were outgained by less than a quarter of a yard per play). The Owls have allowed three conference opponents to get to 40 points and four of five have scored at least 30. Other than homefield, I'm not sure what advantages Rice has. Consider that both the Miners and the Owls have played three common conference opponents thus far (Louisiana Tech, North Texas, and UAB). UTEP has been outscored by those three teams by 31 total points. Rice has been outscored by 83 total points in those games. The transitive property is not a perfect proxy for team strength, but it gets the point across here. Take the Miners to get their first win of the season and of the Dana Dimel era. Despite probably not being that good, South Florida's loss at Houston represented just their third defeat in twenty games under Charlie Strong, and more importantly, their first in 2018. While the Bulls are still very much alive in the division race (they close with games against Cincinnati, Temple, and UCF), the loss dropped them out of the polls and puts them in a rough situational spot against Tulane. A win against the Cougars would have moved the Bulls to 8-0 and likely earned them a spot in the initial College Football Playoff Rankings. The loss served to blot them from the national conscience, at least until they beat a competent team. Of South Florida's seven wins in 2018, just one has come against an FBS team with a non-losing record (Georgia Tech is currently 4-4). The Bulls were home underdogs in that game, but in their other five FBS wins, they have been moderate to large favorites and have done a terrible job of covering the spread. The Bulls are 1-4 ATS as a favorite this season, winning one score contests against Illinois, East Carolina, Tulsa, and Connecticut. Those four teams have combined for a 7-24 record in 2018. South Florida's lone cover as a favorite in 2018 came against Massachusetts, a team that is 3-6. Of course, Tulane is not exactly a powerhouse, entering play with a 3-5 mark. However, the Green Wave do run a unique offense, and as mentioned before, last week's bubble-bursting loss could negatively impact the Bulls. All season, South Florida has toyed with losing to bad teams. Why would this weekend be any different? I couldn't let you leave without giving you my thoughts on the latest Game of the Century. I'm not part of the faction that yells 'Bama ain't played nobody'. The Tide are damn good, but over their final three conference games and in a potential SEC Championship Game appearance we are going to find out how good they are. I know, what a nuanced take. Let me be more specific. In their first five conference games, Alabama has faced teams that rank ninth (Missouri), tenth (Texas A&M), eleventh (Tennessee) thirteenth (Arkansas), and fourteenth (Ole Miss) in the SEC in yards allowed per play (in conference play only, my preferred metric and one I have data on back to 2005). Their next three conference games are against teams that currently rank fourth (LSU), first (Mississippi State), and sixth (Auburn) in that category. Assuming they advance to the SEC Championship Game, they will either face the second (Kentucky!!) or fifth (Georgia) ranked team. Those YPP numbers are not adjusted for opponent, so you can quibble with the rankings a little (and obviously, the teams Alabama has played rank so low partially because Alabama destroyed them), but long story short, the road gets much tougher from here. This is where we will learn if Alabama has one of the best teams of all time, or just (probably) the best team of 2018. Two winning weeks in a row. Let's try for three. As always, home teams in BOLD. With the other wild results in Week Seven, Iowa State's dominating win over West Virginia was sort of lost in the shuffle. The victory was their second in a row and evened their overall record at 3-3. With three of their five remaining conference games coming at home and another a road trip to Kansas, Iowa State still has a shot at getting to the Big 12 Championship Game. It's a long shot, but more realistic than winning the Mega Millions jackpot. It's a small sample, but in their two games against Texas Tech under Matt Campbell, the Cyclones have beaten the Red Raiders by a cumulative margin of 97-23. Those are Alabama-type numbers. Revenge could certainly be a factor for Texas Tech, and were Iowa State not off a bye, they could be hung over from their huge upset of West Virginia. As it stands though, Iowa State is one of the most well-coached team's in the nation. Consider it a gift when they are laying less than a touchdown at home. Take the Cyclones to win, and win rather easily here. Yes, America, go ahead and start preparing yourselves for a potential appearance by Virginia in the ACC Championship Game. The Cavaliers have not necessarily looked great doing it, but they are 3-1 in the conference with a head to head win over Miami. Their division title hopes may well come down to their season ending trip to Blacksburg. But first, the Cavaliers must deal with a North Carolina team looking to play the role of spoiler in The South's Oldest Rivalry. Thanks to their poor performance early in the year due in part to suspensions and their nationally televised bloodletting at Miami, North Carolina is under-valued by the public. The Tar Heels are 1-5 and likely to finish without a postseason bid for the second consecutive season. However, in ACC action, the Tar Heels have arguably played about as well as Virginia at least in terms of yards per play. Both teams are a little under water in Net YPP, but while North Carolina is 1-3 and out of the contention in the division, Virginia is 3-1. We can thank the usual suspects of turnover margin (North Carolina is -4 in ACC play while Virginia is +2) and close game performance (North Carolina is 1-2 while Virginia is 1-0). Obviously, that hay is already in the barn, but prospecting forward, I would be hesitant to lay a lot of points with Virginia. Not only do the Cavaliers rank near the bottom of the conference in yards per play, they also play at a plodding pace. Last week, North Carolina was an underdog of a similar margin against Syracuse. The Orange play at a blistering pace, with that game featuring seventeen possessions apiece in regulation. By contrast, this game will probably only have eleven or twelve, so each trip down the field will be exponentially more valuable. As Virginia basketball fans know, playing with a slow pace is an advantage against more talented teams, but when the roles are reversed, that slow pace can allow the underdog to hang around. Assuming North Carolina has not quit on the season, this should be a four quarter game. Take the Tar Heels to keep this one close. These two FBS noobs face off for the second time ever with Coastal Carolina looking to avenge last season's loss and move one step closer to bowl eligibility in just their second season of big time football. The Chanticleers have already exceeded last season's win total (3) with another month to play. Meanwhile, off their first bowl win in school history, Georgia State has struggled. The Panthers narrowly edged an FCS team in their first game and have allowed nearly 40 points per game to their six FBS opponents. If you are looking for points you may want to check this one out on ESPN+. While Georgia State has been atrocious on defense, if we limit our view to Sun Belt action only, the Chanticleers have actually been worse, permitting their three Sun Belt opponents to average nearly eight and half yards per play! Coastal does not have the type of defense you want to be laying points on the road with. In fact, they been a road favorite just one other time in their short FBS history. They lost. Don't be surprised if the same thing happens here as Georgia State has already pulled an outright home upset earlier this season. Curiously, the team they trounced as about a six point underdog, beat Coastal by nearly four touchdowns in Conway. I wouldn't recommend betting exclusively using the transitive property, but it does make this spread all the more interesting. After playing a soft non-conference schedule and climbing into the top-15 of the AP Poll, conference play has not been kind to Mississippi State. The Bulldogs have lost three of their first four league games while scoring just three offensive touchdowns and averaging just 4.27 yards per play. In SEC play, the Bulldogs have had no passing attack to speak of as Nick Fitzgerald has completed just 44% of his passes while averaging under four yards per throw. In non-conference action, the offense was able to dominate on the ground, but once the competition stiffened, the limitations of Fitzgerald have been magnified. Despite being just one game better overall, the general mood of the program is much better in College Station. That's primarily because the Aggies two losses have come to arguably the two best teams in college football. The Aggies nearly upset Clemson at home and were marginally competitive in covering the spread against the Alabama juggernaut in Tuscaloosa. I think the wrong team is favored here. Mississippi State is so limited on offense, it has been very difficult for them to score against the better defenses on the schedule. Take the Aggies to win outright in a defensive struggle. I picked against Boise State last week, and while that didn't work out, I'm going to fade them again as this does not appear to be your vintage Bronco team. Through four conference games, the Broncos are still under water in terms of yards per play, meaning they have allowed more yards per play than they have gained. Even in their blowout victory over Colorado State, the formerly stout Bronco defense allowed over seven yards per play to the Rams. Meanwhile, Air Force has started to figure things out on both sides of the ball of late, winning two of three after a 1-3 start. The Falcons need to win three of their final five to qualify for a bowl, so they should be motivated even though they have Army on deck. The Falcons have actually beaten the Broncos the last two times they have faced them at home and three of the last four overall. Air Force has been tough as a home dog, going 6-1 ATS in the role since 2014. In fact, they have won outright in their six covers! Look for more of the same this week with the Falcons giving the Broncos all they can handle. Two months into the 2018 season, these two AAC teams have combined for three wins, with just one coming against an FBS opponent. A bowl game is still theoretically on the table for both, with Tulsa needing to win out and Tulane needing to win four of their last five to qualify. More than likely though, 2018 will end in disappointment for both these squads. Tulane at least has the excuse that they have not been very good in the recent past and are still adjusting to Willie Fritz's option scheme. Meanwhile Tulsa won ten games just two seasons ago. Since pummeling Central Michigan 55-10 in the Miami Beach Bowl, the Golden Hurricane are just 3-16 and their once potent offense (averaged 39.8 points per game in their first two seasons under head coach Philip Montgomery) has disappeared. Tulsa is averaging just under 21 points per game in 2018 and have not scored more than 26 points against any FBS opponent. In a bid to give the offense a spark, Montgomery inserted the aptly named freshman quarterback Seth Boomer into the starting lineup. While Tulsa nearly upset South Florida with Boomer taking snaps, his passing numbers have been among the worst in the nation. In three games as a starter, Boomer has completed just 35% of his passes. As a useful comparison, on the team level, Navy has the lowest completion percentage in the nation at 44%. Boomer is basically playing worse than a triple option quarterback without the big play passing and efficient rushing potential. Tulane is not a good team by any stretch, but Tulsa's offense is very bad, and you don't want to be laying points with a quarterback that struggles to complete a third of his passes. I understand why Tulsa is favored. Were the line reversed, I'd advise you to stay away, but I think Tulane can cover this small number and potentially win outright. Maybe the game hasn't passed Butch Davis by. After guiding the Panthers to their third ever bowl game in 2017, I expected some regression in their second season under Davis. The preseason consensus had the Panthers in the middle of the pack in Conference USA, well behind their in-state rivals, as well as Marshall and Middle Tennessee. But, nearly two months into the season, the Panthers only losses are to Power Five teams (Indiana and Miami). They are unbeaten in conference play and should be the odds on favorite to represent the east division in the conference championship game as both Florida Atlantic and Marshall must come to them later in the year. That game against the Owls is next week, so they certainly could be looking past the Hilltoppers. Even then though, it may not matter. Western Kentucky is not good, and they just suffered one of the most amazing losses in college football history last week. They finally scored more than 30 points for the first time all season against a woeful Old Dominion defense, but at 1-6, they may have packed it in. I don't like the hook, but I think Florida International should win this by at least a touchdown. We whiffed on a few picks (thanks Arizona and Georgia Tech), but somehow we ended up with a winning week. Let's make it two in a row. As always, home teams in BOLD. Three weeks ago, this was beginning to look like a lost season for Colorado State. The Rams were 1-4 and had just lost at home by sixteen points to an FCS team. But they bye week came at a perfect time and the Rams are currently riding a two-game winning streak. However, after the poor start, there is almost no margin for error if they have designs on qualifying for a sixth straight bowl game, but 2-10 seemed like a legitimate possibility when October began. The Rams have two almost certain defeats left on the schedule (this game and a home date with Utah State), so they need to sweep the other three which include a home game against Wyoming and road trips to Nevada and Air Force. The odds are against them, but if nothing else, this slight downturn should ensure they can hang onto Mike Bobo for another season or two. Under Bobo's guidance, the Rams have consistently boasted above-average offenses. His first three teams ranked seventh, first, and first in the Mountain West in yards per play and the current iteration ranks second. Quarterback KJ Carta-Samuels, a transfer from Washington, leads the explosive passing attack. Of course, even with the offensive success, Colorado State has four losses for a reason and that is obviously thanks to the leaky defense. Opponents are averaging nearly seven yards per play against the Rams, but they have played better since the bye, holding both San Jose State and New Mexico below six yards per play. The Rams will attempt to slow down a Boise State team that has disappointed since an explosive 2-0 start. The Broncos looked for all the world like they would be the G5 representative in the New Year's Six after beating Troy and Connecticut by a combined 118-27 margin. Since then, Troy has been decent (loss to Liberty notwithstanding), but Connecticut has proven to have one of the worst defenses in college football history. Plus, the Broncos have lost two games, including one to an Oklahoma State team that has dropped three of four and another to a solid, but unspectacular San Diego State team. They have also beaten Wyoming and Nevada by less than impressive margins. Add it all up, and this line seems to be about a touchdown too high. Boise has been downright bad as a home favorite under Bryan Harsin, posting an 8-19 ATS record in the role, including a 5-18 ATS mark as a double-digit favorite. Call it a Smurf Turf Tax or general ignorance on the part of the betting public, but Boise State has been criminally over-valued at home since Chris Petersen left. Colorado State is not good enough to win, but their offense should do enough to keep this within three touchdowns. When the Southpoint Casino released their season win totals back in May, it was obvious not much was expected from the Bearcats in 2018. Cincinnati's over/under total was just four, meaning the Bearcats eclipsed that by the time October rolled around. After winning just eight games over the past two seasons, another 4-8 campaign seemed reasonable. Optimists probably expected the Bearcats to return to the postseason in 2019, which would be Luke Fickell's third season in charge. However, the youth movement has coalesced a year ahead of schedule. The Bearcats are 6-0 and ranked for the first time since 2012. Off a bye, can they clinch a winning record and make themselves legitimate threats to the two Florida schools in the East division of the AAC? Even when they were struggling last season, the Bearcats were formidable as a road underdog. They covered in four of five games and won outright twice. They continued that trend this season, winning their first two games against UCLA and Miami (Ohio) as road and neutral site underdogs respectively. Temple will represent their stiffest test yet, as the Owls have improved since opening with losses to Villanova and Buffalo. Both teams have yet to face a good conference opponent, with their five vanquished foes combining for a 2-12 conference record. However, Cincinnati has been more dominant against their soft schedule, averaging about three more yards per play than their opponents. Temple has not been bad by any means, as the Owls are averaging north of two yards more per play than their opponents, but I think the wrong team is favored here. The time will come to fade Cincinnati as the year progresses (they are not one of the 25 best teams in the country), but that time is not this week. Since being blown out at home by Army at the end of September, Buffalo has returned to form in MAC play, winning their last two game to improve to 3-0 in the conference. That Army game, a non-conference game against a team that runs a unique offense appears to be an aberration. The Bulls allowed 42 points to the Black Knights, but against the other five FBS teams on their schedule, they have allowed just 20 points per game. In MAC play, the Bulls have one of the best defenses this side of Northern Illinois, and while their star receiver, Anthony Johnson, has struggled (just 352 receiving yards after averaging over 100 yards per game last season), other players have stepped up. KJ Osborn has over 600 yards receiving and a pair of freshmen running backs have combined for nearly 1000 yards on the ground. The Bulls should have a field day against a Toledo defense that has allowed over 41 points per game and over seven yards per play to FBS opponents this season. Winning on the road is never easy, but I would be comfortable backing Buffalo by at least a field goal. With their loss to Virginia Tech last weekend, North Carolina has now lost sixteen of their last nineteen games against FBS opponents! That would explain why Larry Fedora might be on the hot seat despite a division title just three seasons ago. However, if you take a deeper dive into the box score, you'll notice the Tar Heels actually played pretty well. The Tar Heels outgained the Hokies by nearly 150 yards and averaged nearly two and half more yards per play! Alas, they were done in by untimely turnovers and missed field goals. The Tar Heels are now at full strength after their offseason suspensions, and if they are not totally demoralized from last week's result, I think they are a solid play here. Syracuse opened the season 4-0 and nearly upset Clemson, but the Orange followed up that Clemson loss with another road loss at Pitt. Overall, Syracuse, despite their offensive pedigree under Dino Babers, is averaging under five yards per play in conference games. If you look at just the records and ignore the yardage and yards per play numbers, this spread seems right on. However, a Tar Heel win would not shock me here. North Carolina is improving and should keep this game close. The Wolfpack have played tight games with the Tigers the past two seasons. Can they break through and take control of the Atlantic Division by winning in Death Valley for the first time since 2002? I doubt it, but I think there is a good chance they keep it close. NC State does not have the most explosive offense in the country, but senior Ryan Finley may be the best quarterback the Tigers face until the College Football Playoff. That's a partial indictment of the rest of the ACC, but mostly praise for Finley's talents. The last team to beat Clemson at home also had an NFL talent taking snaps (although you might not know it from his pro performance). As you might expect from a team with the national cache of Clemson, the Tigers have not been kind to degenerates as a double-digit home favorite, posting a 7-11-2 ATS mark since 2014. Meanwhile, NC State is 4-2 ATS as a double-digit road underdog with two outright wins in the same span. I don't think NC State will be able to win, but this game should be competitive. In their second year back from the dead, UAB can put themselves in prime position to win the Conference USA West division. The Blazers are the only team in the division without a conference loss, and a win here would give them a head-to-head win against their two biggest division competitors after they upset Louisiana Tech two weeks ago. The Blazers have arguably the best defense in Conference USA, as they have allowed just fourteen points through their first three conference games. Overall, the Blazers are allowing just over fourteen points per game on the season and outside of a head-scratching performance at Coastal Carolina where they allowed the Chanticleers to roll up 47 points, they have been fantastic. They have been especially prolific in getting to opposing quarterbacks, accumulating 23 sacks and 47 tackles for loss through six games. But don't sleep on the Mean Green defense. While their defense has not been quite as havoc-inducing as UAB's, they do have 22 sacks and 51 tackles for loss (albeit in one more game). However, the Mean Green have allowed opposing defenses to sack them eleven times and tackle them 54 times behind the line of scrimmage. Meanwhile, UAB has done a better job of avoiding negative plays, allowing just five sacks and 24 tackles for loss on the season. The Blazers should spend a great deal of time in the Mean Green backfield while keeping the Mean Green out of theirs. Plus, UAB has been great as a home underdog under Bill Clark, posting a 5-1 ATS record while winning outright the last four times they have been in the role. After fifteen years, Ol' Crimson is finally getting a home game. College Gameday will be making the trip to Pullman for this matchup that will determine control of the Pac-12 North midway through the season. In the offseason, many folks, myself included, thought Washington State might be in for some regression. The Cougars were returning just ten total starters and had some off the field issues including the suicide of Tyler Hilinski and Mike Leach openly job hunting that made it easy to picture a season unraveling at the first sign of adversity. Oh, and they also lost their revered defensive coordinator to a national power, who interestingly has not improved the defense he was hired to co-coordinate. Despite all that, the Cougars have endured. They survived a tricky opener against what we thought was a solid mid-major and cruised through the rest of non-conference action. They lost a nail-biter in their conference opener, but rebounded to beat a solid Utah team and hold off Oregon State before enjoying their bye. After struggling offensively last season (ninth in the Pac-12 in yards per play), the Cougars lead the conference in yards per play behind quarterback and East Carolina transfer Gardner Minshew. Now the Cougars face the new division front-runners fresh off a home upset of Washington. The Ducks upset Washington in overtime, but the Huskies actually averaged about a yard and a half more per play than the Ducks and probably should have won. The Pac-12 won't take the win away (probably), but the Ducks are a little over-valued going forward. I would rather be catching points with the Cougars here, but Washington State has been quite good as a home favorite (at least against FBS opponents) under Leach. Since 2013, the Cougars are 12-4 ATS as a home favorite and with a spread this small in a game this big, give the Cougars a play. It came down to the last game of the weekend, but Wyoming couldn't quite get the cover to give us another winning week. At least we avoided disaster. Let's get back on track this week. As always, home teams in BOLD. Let's dub this game a Friday Night Eliminator (in the Pac-12 South). Arizona enters this game having won two of three after a shaky start, while Utah salvaged their season with a blowout win at Stanford last week. The Wildcats have three losses, but only one (Southern Cal) has come in conference play, so they are actually in better shape than the Utes who have twice as many conference losses. However, the Utes don't have any losses within the division, so a win here would set them up nicely heading into their home clash with Southern Cal next week. This is a typical Kyle Whittingham Utah team that wins with defense. The Utes currently rank in the top 20 nationally in scoring defense, total defense, and yards allowed per play. In a surprising development, Arizona has followed the defense first script, at least in conference play this season. After opening the season 1-2 while allowing nearly 35 points per game, the Wildcats have allowed just 55 points through their first three conference games. The offense has not been nearly as dynamic as it was last season with the presumably injured Khalil Tate rushing for just 109 yards on the season (over 1400 rushing yards last season). I expect this game to be low-scoring with neither team likely to score more than 30 points in regulation. Utah is over-valued after their upset at Stanford last week. While they scored 40 points against the Cardinal, they did have a long interception return contributing to their point total. This offense is simply not good enough to be laying double-digits against a competent team. In their four games against FBS opponents, Utah has only scored eight offensive touchdowns. A glut of Arizona turnovers could turn this into a blowout, but that is true of nearly every game. The more likely result is a close, low-scoring game. Utah will probably win, but they won't cover this number. The implications of this line are interesting. Last week, Iowa played their first road game at Minnesota and were roughly favored by a touchdown. This week they travel to Indiana and are favored by about two and a half or three fewer points. The implication of course being that Indiana is two to three points better than Minnesota on a neutral field. That logic alone makes Iowa seem like an easy play here, especially considering the Hoosiers are coming off a road game at Ohio State. Iowa appears to bet set under center with quarterback Nate Stanley averaging over eight yards per throw in the early going. Iowa will need some help, but the division is still up for grabs with Wisconsin having to face both Michigan and Penn State on the road later in the year, so motivation should not be an issue against Indiana. The Hawkeyes have actually been solid the past few seasons as a road favorite, posting a 10-2-1 ATS record in the role since 2014. Iowa should win this game by at least a touchdown and likely move into the top-25 on Sunday afternoon. 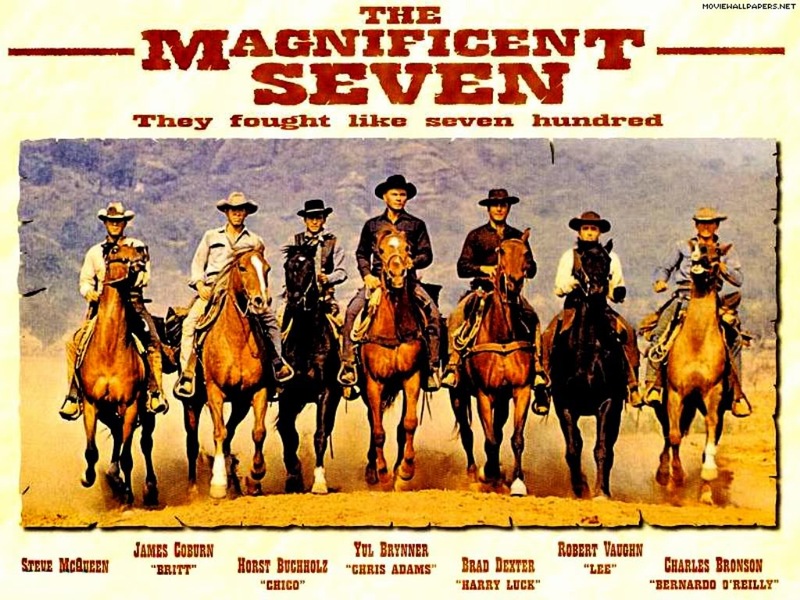 While I was watching the merciless beatdown Georgia Tech put on Louisville last week (which I sort of called back in August, but didn't have the stones to call the week of), I thought there was a great chance this would be a featured game in The Magnificent Seven. However, I thought I would be on the other side. I figured dominance the Georgia Tech displayed, coupled with the fact that Duke lost their last game would make this spread around seven points. With that in mind, I was all set to add Duke to the card. But it does not appear that the Louisville game had any impact on this line. If Georgia Tech had won or lost a tight game, I think spread would have been about the same. Unlike Louisville, Duke is familiar with Georgia Tech's option attack, and the Blue Devils have won three of the last four in this series. However, only one of those wins came in Atlanta. Georgia Tech's road struggles since winning the Orange Bowl are well documented, but they have actually done well in the role of home favorite, posting an 8-4 ATS mark in that span (7-1 since the start of 2016). I like the Yellow Jackets to win by at least a field goal here. Southern Miss is a respectable 17-13 in two and a half seasons under Jay Hopson. However, for diehard Southern Miss fans or fastidious point spread watchers, it feels like the Golden Eagles could have done so much more. Consider that of their 13 losses under Hopson, seven have come when the Golden Eagles were favored. In addition, four have come when Southern Miss was a double-digit favorite! On the flip side, Southern Miss has pulled five outright upsets, including two as a double-digit underdog. So what does all this mean? Well, it means you should be wary in backing Southern Miss as a favorite, but enthusiastic in backing them as an underdog. This is especially true this week as the Golden Eagles face off against a North Texas team that has struggled in their past two games. After opening with four non-competitive wins, the Mean Green lost at home to Louisiana Tech and then barely escaped El Paso last week. Southern Miss is rested off a bye (their second of the season thanks to a weather cancellation) and are good enough to leave Denton with an outright win. The public at large must not have gotten the memo that Jeff Brohm is no longer coaching Western Kentucky. That is the only way I can rationalize this large number. Mike Sanford has been the head coach of Western Kentucky for eighteen games. His teams are 7-11 overall and five of those losses came in games in which they were favored. Overall, as a favorite, his teams are 2-8 ATS, including 0-4 as a road favorite. The 2018 incarnation seems especially ill-suited to cover a large road number as they are averaging just under 19 points per game on the season. Charlotte is far from a good team, and they will probably fire their coach by season's end, but the 49ers have been a frisky home underdog of late, covering four of their last six games in the role with two outright upsets. I'm not quite bold enough to call for another upset, but they should do enough to cover here. To misquote the Bard, 'Something is rotten in the state of Wisconsin'. On the surface, the Badgers appear to be the same dominant defense they have always been for most of the last two decades. They are allowing just over 16 points per game through their first five contests (a slight dip from last season when they allowed under 14 points per game), but if you look closer, you can see some leaks. In their past two games, the vaunted Badger defense has allowed over seven yards per play to both Iowa and Nebraska. The Badgers had not allowed more than seven yards per play in any contest since the 2016 Big Ten Championship Game against Penn State. For good measure, they also allowed over six yards per play to BYU in their upset loss. Michigan quarterback Shea Patterson has not proven he can carve up an elite defense yet, but there is a pretty good argument to be made that Wisconsin is not an elite defense. The only elite defense in this game will be sharing a sideline with him. Playing a night game at home with a chance for a modicum of revenge for last year's game, Michigan should give a great effort. As home favorite, the Wolverines are just 12-11 ATS, but if we ignore the results from the 2017 'rebuilding year', those numbers improve to 11-7. Jim Harbaugh is not one to show mercy to a lesser opponent, so if the Wolverines have a chance to earn some 'style' points, I think they will take it. I don't like the hook sitting out there, but I feel confident Michigan can win this game by double-digits. Arkansas must be paying some sort of Alabama penalty for the line to be this high. Yes, the Hogs were pretty much vaporized by Alabama's now potent offense, but so was every other team the Tide have faced this season, including the team on the other sideline in this game. It should be noted, that of the five previous teams to lose to Alabama this season, each of them won their following game. I would imagine getting 60 points hung on you is embarrassing, but it hasn't really caused teams to not show up the next week. Ole Miss has pounded inferior defenses this season, averaging over 57 points per game in the non-conference portion of their schedule. However, once the competition improves, the Ole Miss offense tends to go missing. The Rebels scored seven points against Alabama and just sixteen in a non-competitive loss to LSU. Prior to last week's bloodletting, Arkansas had played well defensively. The Hogs held each of their first five opponents below six yards per play and were allowing just over 350 yards per game. Arkansas has won the past four games in this rivalry, with the last three being decided by just six total points. I expect another close game here, and I don't see how anyone can have confidence that Ole Miss can take their show on the road against any SEC team and expect to win by at least a touchdown as the Rebels have not covered as a road favorite since 2015. They are also just 3-7 in true road games since the start of the 2016 season. Take the Hogs to cover here and maybe sprinkle a little on the moneyline if you're feeling lucky. We had our best performance of the year last week. Our putrid pick of San Jose State and UTEP both came through. Let's see if we can make it two strong weeks in a row. As always, home teams in BOLD. One of the more amazing things you have probably not heard about is the improvement of the East Carolina defense. In Scottie Montgomery's first two seasons in Greenville, the Pirates allowed an average of over 40 points per game and over seven yards per play! Surmising (correctly) that he might be on his way to the unemployment line, Montgomery hired David Blackwell from Jacksonville State to be his defensive coordinator. The improvement has been outstanding. Through four games, the Pirates are allowing just 25.5 points per game and 4.88 yards per play. That appeared to be all for naught as the Pirates began the 2018 season by losing to an FCS team for the second consecutive year. However, they won the game everywhere but the scoreboard. They allowed just 269 total yards to the Aggies, but were done in by turnovers (-3 margin), including one that was returned for a touchdown. Since that loss, the Pirates have beaten North Carolina, played South Florida to within a touchdown, and beaten Old Dominion. The Pirates have been particularly strong in creating havoc plays. They have 17 sacks through four games after accumulating just 19 total sacks in Montgomery's first two seasons (24 games). The nation at-large is still sleeping on the Pirates, and with the loss to an FCS opponent, East Carolina may not be able to get bowl eligible, but they will be a tough out the rest of the way. Temple is a solid team, but their offense is not strong enough to justify them laying double-digits. Pittsburgh and Syracuse joined the ACC in the same year (2013) and were placed in opposite divisions, but designated permanent rivals, meaning they face off each season. The five games they have played against each other as ACC members have tended to be pretty close, with three being decided by a field goal or less and one featuring a basketball score. Pitt has won four of five the five meetings, and dating back to 2002, the Panthers have emerged victorious thirteen times in the last sixteen meetings. So why on earth am I backing the Orange this week? Syracuse appears to have turned the proverbial corner in their third season under Dino Babers. After consecutive 4-8 seasons, the Orange already have four wins banked and their lone loss came on the road at Clemson. The offense has averaged over 44 points per game in the early going and senior quarterback Eric Dungey has accounted for fifteen touchdowns (nine passing and six rushing). Meanwhile, Pitt has floundered after ending the 2017 season on a solid note with a victory against Miami. That win seems to have been more about Miami wheezing to the finish line rather than Pitt improving. In fairness to the Panthers, two of their three losses in 2018 have come to top-fifteen teams in Penn State and Central Florida, but the Panthers were not competitive in either game, losing by a combined 76 points while scoring just two offensive touchdowns. They also lost to what appears to be a bad North Carolina team on the road and their lone victory against an FBS opponent came at home against a team (Georgia Tech) that has not won a road game since Reconstruction (roughly). Pitt has not protected their homefield under Pat Narduzzi, posting a 3-5 ATS mark as a home underdog. On the other side, Syracuse has rarely been a road favorite under Babers as their opening win against Western Michigan was the only time they have been in that position under his guidance. In fact, this marks the first time they have been a road favorite against a Power Five opponent since 2014. Even though this is uncharted territory for Syracuse, Pitt appears to be a bad team and I expect Syracuse to be able to score enough points to win by at least a touchdown here. Last week, as I predicted, if the game was close, Miami would find a way to blow it. The Redhawks dropped a heartbreaker to Western Michigan last week, to fall to 1-4. The brass has been patient with Chuck Martin, but he cannot afford many more losses if he wants to keep his job. Can Miami bounce back against an Akron team that has only played three games more than a month into the season? The Zips are 2-1 thanks to a turnover fueled upset of Northwestern. The Zips followed that up with a solid performance in a road loss to Iowa State. Now they return home to open the defense of their MAC East division crown. Miami of Ohio has been a solid play as a road underdog under Chuck Martin, posting a 9-4 ATS mark. And, lest you think they have racked up those covers as huge underdogs against Power Five opponents, consider they are 9-4 ATS as a road underdog in MAC play with four outright upsets. While Akron has enjoyed a solid September with a massive road upset, Miami is the more desperate team. Their loss last week came to a team from the MAC West, so technically their division title hopes are still alive. I think the Redhawks circle the wagons and get a huge road win. Their first four opponents have not been especially strong, but Colorado is 4-0 for the first time since 1998! In the wide-open Pac-12 South, where every other team already has at least one conference loss, the Buffaloes have a chance to bank a second conference victory before heading out on an important two game road trip to face the division favorite (Southern Cal) and overall conference favorite (Washington). You probably don't know this, but the Buffs have the nation's leading receiver (at least in terms of yards per game). Sophomore Laviska Shenault Jr. is currently averaging nearly 150 yards per game through the air. In three games against FBS competition, Shenault has snagged 33 passes for 514 yards! His contributions have helped the Buffs average over 40 points per game in the early going. For comparison's sake, they averaged just over 26 points per game last season. If the Buffs are not looking ahead to next week's showdown with the Trojans I think they have a great shot at covering this number. The Buffs, in the rare times they have been home favorites under Mike MacIntyre, are 8-4 ATS. Couple that with the fact that the Sun Devils have already lost both of their road games thus far in 2018, and the Buffs are an easy play at this small number. Last week, the streak came to an end. After beginning his career with eight consecutive conference wins (nine if we include last year's championship game) at Florida Atlantic, Lane Kiffin and the Owls fell at Middle Tennessee thanks to a late two-point conversion. The loss dropped the Owls to 2-3 and continued a disturbing offensive trend. After scoring at least 30 points in each of their final twelve games last season (and averaging nearly 45 points per game in that span), the Owls have averaged just under 27 points per game against FBS opponents in 2018. It's not a perfect comparison thanks to the disparity in talent, but this reminds me a lot of Lane's 2012 Southern Cal team. Recall his 2011 team, which was ineligible for the postseason, finished 10-2 with a late victory against eventual Pac-12 champion Oregon. That raised expectations significantly for the next season, and the Trojans began the year ranked first in the nation. They never came close to meeting those expectations though, losing their last three games to finish 7-6 with a disinterested Sun Bowl loss to Georgia Tech capping the disappointing season. The Owls weren't ranked number one to start 2018, but they were prohibitive favorites in Conference USA. Hopes for a conference title are not dead yet, but the margin for error has been significantly reduced. Can the Owls get back on track against a 1-4 Old Dominion team? The oddsmakers seem to think so. I assumed this line would be closer to ten points when it came out, so I think there is great value on Old Dominion. The Monarchs made a quarterback change two weeks ago with former walk-on Blake LaRussa replacing Steven Williams. In those two games, the offense has scored 84 total points against two pretty good defenses (Virginia Tech and East Carolina). Contrast that to their first three games where the offense totaled just 55 points against weaker competition (Liberty, Florida International, and Charlotte). Florida Atlantic has a bad defense, so even if they race out to an early lead, Old Dominion will have ample opportunity to cut into it and the backdoor will be wide open. I expect a relatively close, high-scoring game here and this line indicates you have to pay a premium to back Florida Atlantic. Take the Monarchs to cover this large number. Last week Louisiana Tech gave themselves the inside track to the Conference USA West title by beating preseason favorite North Texas in Denton. Now the Bulldogs have a chance to consolidate their hold on the division by beating the division darkhorses from Birmingham. A victory against the Blazers would move the Bulldogs to 2-0 in the conference with victories against their most likely challengers. A trip to Hattiesburg awaits in November, but after this game, the schedule features mostly the dregs of the division (Rice, UTEP, and UTSA). This is Louisiana Tech's second home game of the season and first in a month, so Ruston should be rocking. So why is UAB the pick? Well, for starters, the Blazers have been solid plays as an underdog under Bill Clark, posting a 6-3 ATS record. If we only consider games against fellow Group of Five teams, the Blazers are even more impressive, going 4-1 against the number. In addition, the Bulldogs were probably a little lucky to escape with a win at North Texas last week. The Mean Green outgained the Bulldogs by nearly 70 yards and averaged almost a full yard more per play. But, the Mean Green committed two turnovers while the Bulldogs played with a clean slate. One of those turnovers came inside their own ten, gifting the Bulldogs a touchdown. The Mean Green also missed two field goals, with the Bulldogs blocking the potential game-winner in the final minute. The Bulldogs won't be giving the win back, but that win has this spread too high. I was expecting this number to be closer to a field goal, so UAB is an easy play here. After winning three games all of last season, Hawaii won five games before the calendar flipped to October in 2018. Of course, the last few weeks, they have cost degenerates money by not covering the spread. And yet, oddsmakers continue to make them favorites. While the Rainbow Warriors have five wins, the four FBS teams they have beaten have combined for a 4-14 overall record. In may not be hyperbole to say Wyoming is the best team Hawaii has faced thus far. Army and Navy may have some point of contention with that statement, but nonetheless, its close. Wyoming has struggled in the early going offensively, much like they did throughout 2017 despite the presence of a first round pick at quarterback. But Hawaii may be just what they need. The Rainbow Warriors have allowed an average of over 32 points per game in the early going. Their pass defense has been particularly galling, allowing opponents to average over nine yards per throw. After Boise State and their stout defense last week, this will be a welcome change for Wyoming. In addition to their defensive struggles, Hawaii has not done well in the role of favorite under Nick Rolovich. The Rainbow Warriors are 0-5 ATS as a home favorite and 0-8 ATS as a favorite overall. Meanwhile, Wyoming has been solid as an underdog under Craig Bohl. They have posted an 11-7 ATS mark in the role and have been even better as a slight underdog of late. They have won outright the past three times they have been a road underdog of a touchdown or less. Look for more of the same on Saturday night if you can manage to stay up late.